Wow! As someone who went into this movie not knowing a thing about it and expecting to see a terrible rip off of 2018's The Nun, I was pleasantly surprised. The Bad Nun is an entirely different and exceedingly good horror film, which touches on mystery, suspense and some genuinely creepy scenes, aided by an incredible soundtrack of stringed instruments; this movie has some serious Psycho vibes! Don't be fooled by the poster! Expertly written and directed by Scott Jeffrey (House On Elm Lake and 12 Deaths Of Christmas), this is one of those films, which goes to prove that you don't need a large budget to bring a good story to life on the big screen. Eerily enough, The Bad Nun is based on true events and centres around a character named Aesha Wadia, played by Becca Hirani (2016's Fox Trap and 2017's Unhindged). Aesha is lost on a downward spiral of self-destruction and is soon sent away by her loving mother to an isolated bed and breakfast in Kent in order to get herself back into the right headspace to go back to her studies. Aesha is greeted by Dan, played by Thomas Mailand (The Inconsiderates), who is the somewhat quirky owner of the establishment - honestly reminded me a lot of Salad Fingers! She also embarrassingly discovers that there is another guest staying in a secondary building on the property,a French girl named Tilda, played by Mika Hockman (2010's It's Natural To Be Afraid). That night, Dan goes out on a date, leaving Aesha virtually alone in the house and she decides to break the rules by inviting her best friend Imogen, played by Tiffany-Ellen Robinson (2017's Roofied). But what starts off as a fun night in, waiting for her bestie to drive out and sneak in for a girly night of movies, soon changes into a night of sheer terror, when an unrelenting nun starts to persistently knock on her door, asking to come inside. The entire cast of this film is currently relatively unknown, however, they all give a stellar and all too real performance, which is absolutely applaudable. I absolutely loved every moment of this proper British slasher, from its incredibly detailed sound effects, well thought out cinematography (for the most part) and its solid story, which comes with a trigger warning, as it does touch on the subject of child abuse within the church. It features a piece of film which gives the audience the feeling that something absolutely sinister happened, however, this precluding scene is played on loop, to the point that the words said become muddied, unclear and almost meaningless, in a homage to the films of Harmony Korine. If you love horror, then you have to see this movie! 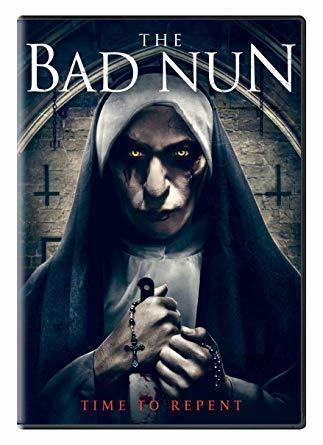 The Bad Nun is not rated, however, I would not recommend it for anyone under the age of at least 15, as it contains scenes of horror as well as sexual references. Why? A super creepy movie!